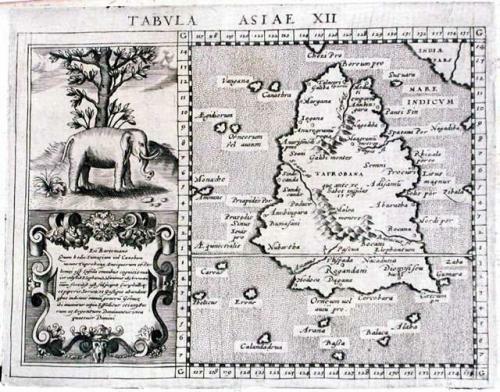 A Ptolemaic map of ancient Sri Lanka (Serendip, Ceylon) surrounded by mythical islands. Based on the 1561 Valgrisi edition. Text on verso. The map comes from a scarce pirate edition published by Petrus Keschedt in Cologne one year after the publication of Magini's original work. Ortelius informed Magini in November 1597 about this and the publication was stopped till 1608 when a new edition was issued by Keschedt. Although the map is based on Magini's 1596 Geographiae it is in fact a new plate. The Magini's 1596 edition of Geographiae was the first reduced size version of Mercator's atlas. This is the second. Claudius Ptolemaeus, better known as Ptolemy (born after 80 and died before 180 CE) made many important contributions to geography and spatial thought. He wrote on many topics, including geography, astrology, musical theory, optics, physics, and astronomy. Ptolemy collected, analyzed, and presented geographical knowledge so that it could be preserved and perfected by future generations. These ideas include expressing locations by longitude and latitude, representing a spherical earth on a flat surface, and developing the first equal area map projection. Although his Geography hasn't survived to this day it is thought that in the 13th century a Bizantine monk discovered his manuscripts and had them reproduced, including 27 maps of the then known world.